Liberia was founded in 1822 as a place to resettle freed American slaves, with Monrovia as its capital. Originally divided into two parts — Monrovia proper, south of the Mesurado River with the city’s Americo-Liberian population, and Krutown, north of the river, mainly inhabited by ethnic Krus and other local tribes. Old Krutown was demolished in 1945 for construction of new port facilities and its residents resettled. The expanded port remains important to the economic development of Liberia. In Monrovia’s humid tropical climate, obtaining a cloud-free view of the city from satellites is quite rare. The Corona mission returned a partially clear photo of the city in February 1966 (see inset). At that time, the city’s growth was limited by an extensive mangrove swamp along the Mesurado River and Monrovia did not expand beyond the peninsula. 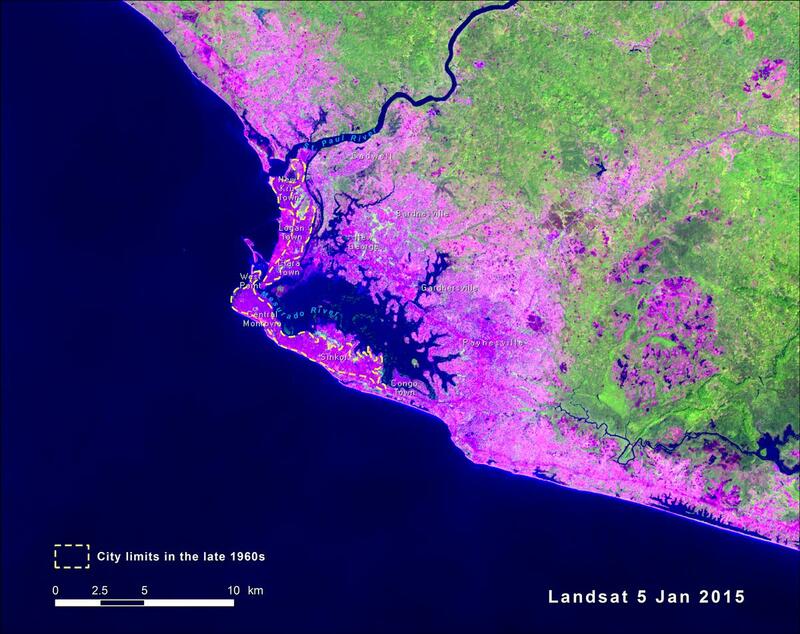 Monrovia’s dramatic growth from 1986 to 2015 is shown in Landsat satellite images of the city. 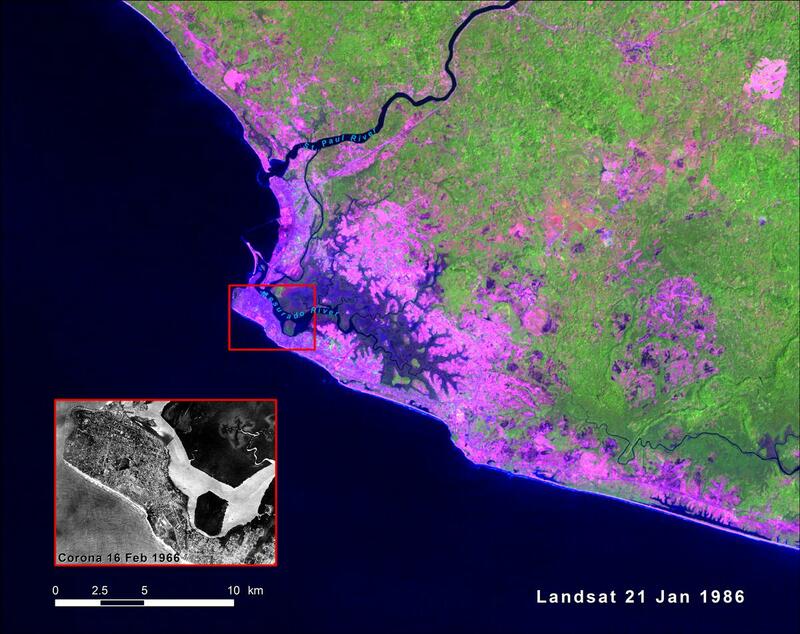 The 1986 image shows that the city grew first around the mangrove swamp and then along the southern coast. By 2015, the city had expanded even farther inland and along the west side of the St. Paul River, outside of the Greater Monrovia district. In the past four decades, the population of Monrovia increased 13-fold, from about 80,000 in the early 1960s to over 1,100,000 in 2015. The land cover maps indicate that its built-up area increased from 100 sq km in 1975 to 176 sq km in 2013. Highest housing densities are found in the historical center of the city; from there, housing density gradually decreases toward the outskirts. The reasons for Monrovia’s population growth include an upsurge in both rural-to-urban migration and inter-urban migration. The present economy of Liberia is very Monrovia-centric, and there are large disparities between Monrovia and other parts of the country in terms of wealth, infrastructure, and possibilities for participation in the political process. Part of this is due to Monrovia’s huge population; Liberia’s second largest city, Gbarnga, has only 60,000 people. During the civil wars when Monrovia was under control of peacekeeping forces and governed by interim governments, many rural Liberians fled to Monrovia for safety. After the wars ended, many of those internally displaced people chose to remain in the city. As in many other fast-growing African cities, the development of infrastructure and social services can hardly keep pace with rapid population growth, leaving many of Monrovia’s poorer neighborhoods in slum-like conditions. Combined with extensive war damage, Monrovia faces the daunting challenge of rebuilding at the same time as extending its urban infrastructure (Ngafuan, 2010).